Yam Balls make a great breakfast meal or snack and it is so delicious! It is another way to enjoy sweet yam. If you do not have white yam where you live, you can manage sweet potatoes but they do not taste the same. Peak Milk makes the yam balls moist and creamy. Scotch bonnet pepper is atarodo, ose oyibo or atarugu. Paprika is sweet peppers that are common outside Nigeria, in Nigeria use tatashe. 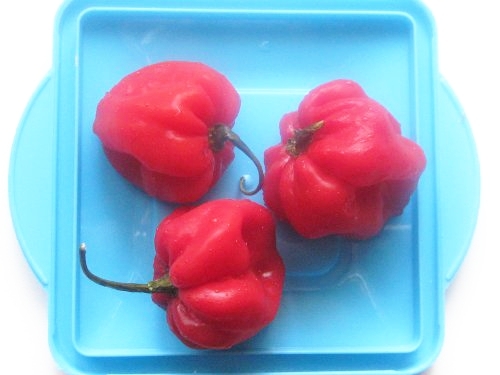 When using tatashe, you may want to skit the atarodo, ose oyibo or atarugu (scotch bonnet pepper). You can use carrot oil to fry the pepper and onions, see the video below. Boil two of the eggs till hard. Then cut into pieces. I get about 8 pieces from one egg. Pour enough water to about the same level as the yam cubes, add the seasoning cube and black pepper and start cooking on medium heat. After 30 minutes, the yam should be soft with a little water in the pot. Add salt and the cubes of butter, stir and set aside to cool down a bit. Pour a little vegetable oil in a frying pan and fry the onions and peppers for about 7 minutes. Mash the boiled yam, adding Peak Milk as you mash. You just need to mash the yam for a bit. See the video below. Add the fried peppers and onions and mix very well. Set some vegetable oil in a deep pan to heat up. The oil should be 3 inches deep. Mould the mashed yam into balls and set aside. Break the remaining egg and whisk. 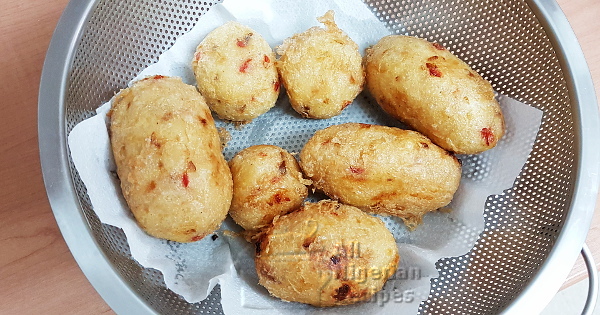 When the oil is hot, coat each yam ball with the beaten egg before throwing into the hot oil. Put as many balls as you can without overcrowding. Stir often and at the first sign of browning, it is ok to take it off the oil. Serve with a chilled drink or for breakfast with other breakfast meals.